The subway system in America's capital city is set to be the scene of a poster campaign war between a pro-Palestinian organization seeking to harm Israel's image and a pro-Israel group which has decided to fight back. Last month, the 'US Campaign to End the Israeli Occupation' (ETO) placed 20 poster ads showing "an imposing tank pointing its main firing turret at a child with a schoolbag walking along a dirt road," the Canadian Jewish News (CJN) reported. But a response to the anti-Israel campaign was not long in coming, after the Los Angeles-based StandWithUs (SWU) decided to launch its own pro-Israel poster ads. Describing the ETO posters as "deceptive and emotionally manipulative," SWU's International Director, Roz Rothstein, said: "Israel is not fighting children. It is defending itself against extremists like Hamas, Hezbollah and Islamic Jihad whose charters call for Israel's obliteration and whose terrorist attacks target civilians, including school children and toddlers." 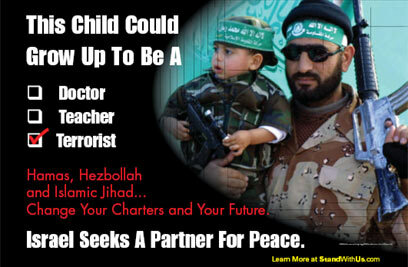 A press release sent by SWU said the group "will launch a month-long ad campaign in mid-May through June 11, urging Palestinians to teach their children peace instead of hate, and urging Palestinian extremists to reform." "SWU's ads will appear in 20 downtown Washington DC metro stations to counter the misinformation in an anti-Israel ad campaign scheduled to run in the stations concurrently," SWU added. "The anti-Israel ads misinform the public about occupation, funding, and responsibility for violence," the statement said, adding: "Israel withdrew completely from Gaza in 2005 and from over 40% of the West Bank almost nine years ago. The land was turned over to the Palestinian Authority and 98% of Palestinians are self-governing under its rule. Unfortunately, the 2005 withdrawal did not promote peace. Instead, rocket attacks from Gaza into Israel rose four-fold." "America has also given billions of dollars in aid to the Palestinians either directly or through the United Nations over the years," SWU said. Speaking to Ynetnews, Rothstein said SWU may expand its poster campaigns to other cities, and possibly to other countries too. "Other communities have expressed interest in our metro ad campaign. With their support, we could expand it as part of our ongoing effort to raise public awareness about the obstacles to peace. We are already preparing an online campaign to amplify this critical message," he said. Rothstein added that Israel's supporters in US and Europe should take an assertive stance in the information battle. "Have confidence in the justness of your position and remember that you are fighting not just for Israel and Jews, but for all people who believe in fairness and human rights. Build coalitions for strength and mutual support, and to brainstorm about the most creative and effective ways to combat anti-Israel propaganda," Rothstein said. "We know Europeans face an especially difficult challenge. We are opening a StandWithUs branch in Europe to partner with local activist organizations. We are looking forward to developing responses that will resonate with European audiences," he added. 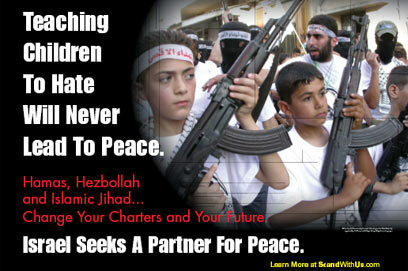 See all talkbacks "Pro-Israel group fights back with ads"